"The Genocide Museum" in Lithuania. Photo: Defending History. Lithuania’s Jewish community isn’t immune from the broader issues facing Jewish existence in Eastern Europe and the same problems of Jewish identity that crop up in Russia, Bulgaria, Poland and elsewhere are prevalent. And just as there are Christian Evangelicals and others who support the policies of the right-wing in the State of Israel and elsewhere in Europe, there are those same voices among Lithuanian politicians and public figures. What is perhaps different in Lithuania than elsewhere in Eastern Europe is that this Gentile support for Zionist ideals doesn’t translate into support for the surviving local Jewish community or contribute to a profounder and more sympathetic understanding of the Holocaust. Visitors to Vilnius will see any number of plaques dedicated to famous Jewish residents of Vilnius and several dedicated to the Holocaust. Those who look a little deeper under the surface might find there are a number of agencies, organizations and institutions operating in Vilnius which seemingly are aimed at promoting Jewish history, language and culture. In fact, both the plaques and monuments, and the majority of these "Jewish” organizations, serve as little more than window-dressing and display show-cases that the Lithuanian government rolls out as exhibits evidencing Lithuanian sincerity in addressing the incomparable atrocity of the Holocaust. Exhibit A at the current time is the bill passed by the Lithuanian parliament to provide restitution for Jewish communal property seized and nationalized, in some cases four or five times, first by the Soviets, then the Lithuanian Nazi puppet regime, then the Nazis, then the Soviets again, and finally by the Lithuanian state that emerged in 1990-1991. One senses almost immediately that there are serious problems even with the modest restitution package, since the US embassy in Vilnius, which has been gently nudging Lithuania for the last 20 years to make some sort of restitution, calls the law "a good first step,” while the legislators who drafted and passed the law continue to call it the last and final offer, after which all claims will be null and void. Moreover the law takes in victims of Soviet crimes as a nod toward Double Genocide, and a clause to be used in the service of that nefarious cause further down the line. It is rumored that many of the decorative "Jewish” organizations in Vilnius and Lithuania will be taking a share of the loot, modest though it be. Therefore, now might be a good time to survey some of these Jewless Jewish orgs. First, and closest to the Vilnius train station (which was the first location in Vilnius to post a sign in 1941 declaring itself "Judenrein”), is the Jewish Cultural and Information Center. You might miss it if you blink, but this operation is located in what is supposedly a "restored fragment of the historical Vilna Jewish quarter,” mandated by the parliament almost twelve years ago now. It is a location with some history, right along Jatkowa ulica (Yiddish: Yátkever gas), now Mėsinių, or Butchers’, street, and many collections of pictures from pre-war Vilna include at least one view up this street which then featured an archway between opposing buildings set somewhat back from the main street, Deutschegasse (Yiddish: Dáytshishe gas), now Vokiečių or German, street. If you don’t manage to find the sign with the official name of the organization, do not worry, for there are also inscriptions in English and Hebrew announcing that it is, in fact, the Shofar Gallery. And it is a gallery. You walk in and are treated to exhibits of artworks, one recent memorable exhibit being composed exclusively of Catholic churches in Vilnius painted on glass. Off in a dark corner there is a counter, behind which some sort of Jewish books are allegedly for sale. In a somewhat brighter location are the amber trinkets for sale to tourists, bearing the words Kaunas, Vilnius and other cities, in Lithuanian orthography with no reference to the beloved Jewish names known to Litvaks and their progeny around the world. Next to the book counter there is a table with pamphlets and fliers, the most prominent being English and Lithuanian leaflets for the Museum of Genocide Victims, also in Vilnius. The Genocide Museum, as it is known for short, is one of the most antisemitic state museums on the planet, featuring 1950s "Forest Brother” antisemitic caricatures with no curatorial comment, and glorification of the LAF Holocaust perpetrators of 1941. This is the "genocide” museum that refused to mention Jews for twenty years, but which finally capitulated to international and domestic pressure by opening a very small Holocaust room, which, strangely enough, features a stained-glass, Catholicized Star of David, and sings even more praises of the Lithuanian Activist Front which is credited in the room with restoring order (!) in the country in the time between the Soviets’ exit and the setting up of the Nazi administration in 1941. The next Jewless "Jewish” organization is located between the fake Genocide Museum and the only real Holocaust museum in Lithuania, the Green House. The Center for the Study of Eastern European Jews is located above a Maxima chain supermarket with no real signs for the guidance of passers-by. The logo from the website appears on an A4 printout near an upstairs office door that is locked. Appreciable build-up of dust seems to indicate the door has not been opened in the recent past. According to rumor on the "Vilna Street” this outfit is actually funded by the Russian-Jewish —now Israeli—tycoon Leonid Nievzlin. Hard times? They appear to engage in historical studies involving Jews and to attend international conferences to deliver papers, while studiously avoiding anything connected with the Holocaust. Presumably the staff is composed of Lithuanian historians, which is the director’s background. Their website was last updated in November, 2011, to announce the completion of a project on Lithuanian museums. Just a hop away is the Jewless Vilnius Jewish Public Library. Again, the signs seem more intended to keep people away than to bring them in. A small sign in Lithuanian is located among the names of various businesses inside an alleyway off Gedimino, Vilnius’s main street. If you happen to be able to read Lithuanian, you’re in luck, because you have to now find another sign in Lithuanian back in the courtyard fronted by multiple buildings telling you that the library is located on the second floor behind one locked door. You are instructed in Lithuanian to push a certain digit (9) on a keypad in order to be allowed in to the public library. Upstairs you pass through an electronic library theft-prevention alarm gate to enter a room with shelves, a counter, but no librarian. Depending on the time of year, one of two overall Lithuanian staff will be found in an adjoining room. The books are all in English and are housed in the first room. The other room with the librarian and the computer has empty shelves. Behind that there is some sort of a conference room with a screen and lots of chairs. I asked the librarian if they had a library catalog. She said they did, but you had to search from the webpage of their parent library, which doesn’t have an English page. What about the signs below, would they be hanging up English versions any time, since all of the books were in English and presumably the clientele would be English speakers? Yes, that must be done, she agreed. The problem, she explained, was too little funding. The Jewish Public Library is funded from the national budget through the Ministry of Culture, but isn’t a high priority, she said. Most of the books hadn’t been cataloged yet and were in storage, and she gave the impression it might be a long time before they were sorted. So the Ministry of Culture isn’t intending to expand the collection, I asked, through book purchases? No, no, these are all donated books, donated from all over the world. What about other Lithuanian libraries, would there be trades or movement of books between the "Jewish” library and the others? No, Lithuania does not really have this tradition, she explained. I looked over the meager collection in the "stacks,” all four shelves, and saw a few things I’d read before, including Black’s IBM and the Holocaust, with a shiny dust cover, looking as if it had never been opened. Not only is the Vilnius Jewish Public Library Jewless, it’s patron-less as well, and only "public” in a very liberal interpretation of the meaning of that word. There are more Jewless Jewish organizations in Vilnius. 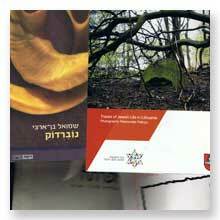 There is a Yiddish institute which does have a Jewish staff member but no Yiddish speakers or Jews among its academic staff during the academic year (in fact, 11 months a year outside the profitable summer course than finances many political excursions on behalf of the government the rest of the year). There is an "international” Lithuanian commission to popularize the notion of Double Genocide. There is even a Kabbalah school of some sort run by non-Jewish people with non-Jewish students—but you begin to get the picture already. Just as the Rosenberg Task Force was engaged in "Judenforschung ohne Juden” and the Prague Ghetto was slated to become a Jewless museum to Jewish culture in a Jewless Europe, so do a number of organizations today in Lithuania pursue the study of an extinct culture, usually at Lithuanian government expense. The problem is, Litvaks aren’t extinct, not even in Lithuania. What is the psychological mechanism that makes it possible for us to cry for the dead while denying the evidence of our own eyes that the dead live and walk before us? Once upon a time a German writer decried the death of the last speaker of Old Prussian. Closer to our own time Americans have looked back with sorrow and nostalgia for the loss of Native American cultures, even as members of those cultures survived, mainly in poverty, but were of no real interest to those same Americans. This year, 2012, has seen a lot of discussion of the Maya calendar and has again brought to the fore the idea of declaring extinct people who still exist. Maya writing was only deciphered with the help of the living Maya languages, and yet people who ought to know better are still speaking publicly of the lost Maya civilization which allegedly died out in the 1200s. This insistence that the living are actually dead held back progress on the Maya script for a hundred years. One is tempted to say that the mechanism by which the living are declared dead and mourned is in fact nothing more than wishful thinking on the part of the mourners, who inevitably belong to the same dominant ethnic group engaged in exterminating the said living. "Judenforschung ohne Juden” in Lithuania represents more than just this mechanism because of the origins of the Lithuanian state in the Middle Ages. One of the mottos of the early nobles in Lithuania and Poland was "nothing about me, without me.” As the historian of Poland Norman Davies has pointed out, the nobility franchise was extended rather broadly in Poland, and of course the same held true in Lithuania as part of Poland, where, for example, Tatar refugees were officially recognized as nobles. 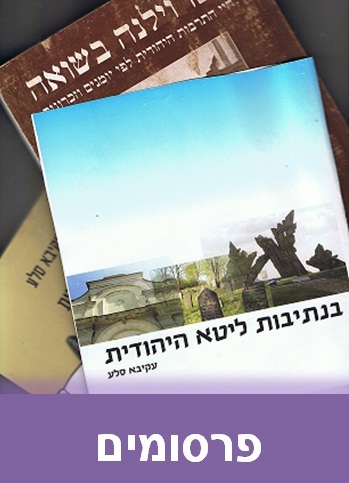 The Lithuanian Jewish Community, which will be one of the main parties in deciding how to divide each year the annually distributed restitution funds, will have to confront the problem of Jewless Jewish organizations seeking funding, and will have to walk a fine line between allocating money for sustaining the actual Jewish community and not alienating nominally Jewish but Jewless organizations who might or might not serve as dupes and lackeys of the government in its world-wide promotion of Double Genocide. This article originally appeared on www.defendinghistory.com.